After a fall caused a concussion and constant headaches, Krysta Kaluzny thought she'd never cheer again. But she returned stronger than ever. After a cheerleading accident caused a concussion that led to daily, intense headaches, Krysta Kaluzny worried she’d never cheer again. Three months spent isolated in a dark room trying to recover left her feeling discouraged. But a doctor urged her to return to activities she loved, and Krysta is better than ever. In August 2017, Krysta was in her backyard practicing flips and jumps on her trampoline when she stumbled and fell. She didn’t lose consciousness, so she simply went on with her day. “My head didn’t hurt right away, but it hurt later in the day. I thought it was just normal,” Krysta, 13, told TODAY. When the headache began, Krysta admitted to her mom that she injured herself while practicing her flips. Kaluzny works as a nurse, so she screened Krysta for a concussion and realized her daughter had one. She urged Krysta to rest. When they went to the doctor, he confirmed the diagnosis: Krysta had a concussion. But even though Krysta followed medical advice, her headaches never subsided. They visited loads of specialists, including an optometrist and neurologist, but no one had any solutions. Meanwhile, Krysta’s life changed dramatically. She stopped going to school because bright lights and loud noises intensified the pain. She couldn’t cheer, so whe watched from the stands and sometimes stretched. It was heartbreaking for Krysta, who loved tumbling and flipping ever since her mom taught her how to do a cartwheel. When she joined her first cheerleading team five years ago, she was hooked. Krysta enjoyed the freedom she felt flying through the air and standing on the top of a pyramid. But after her headaches started, she was trapped in a dark room, isolated from school, friends and cheerleading. Kaluzny saw her daughter change. Finally, Kaluzny took Krysta to headache specialist Dr. Jeffrey Royce. He gave Krysta Botox treatments, but he also wanted Krysta to return to school and more importantly, cheerleading. Krysta had a post-traumatic headache disorder, which can occur after concussion. While 90 percent of children who have concussion report having headaches, most see their pain disappear in 10 to 14 days. Three months after concussion, 43 percent of children report a headache. But a year later, most children with concussions experience headaches as frequently as regular children, Royce said. In rare cases, such as Krysta's, the headaches continue. “The consequence of the headache disorder is not only pain, but also the social deprivation and depression,” he said. While Royce isn’t sure if he can completely rid Krysta of pain, he knows that encouraging her to do what she enjoys will bolster her recovery. 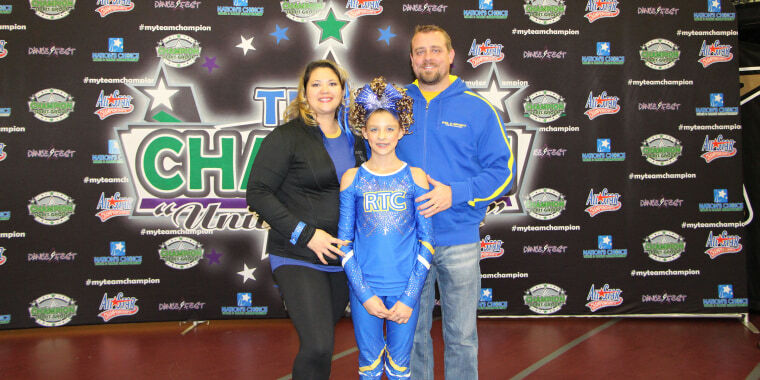 In January, Krysta returned to cheering and after four practices, she joined her team in a competition. “They nailed it with her being back on top. She didn’t miss a beat,” Kaluzny said. Kaluzny feels glad her daughter is doing what she loves.